Animal organs. Digestive system. Esophagus. 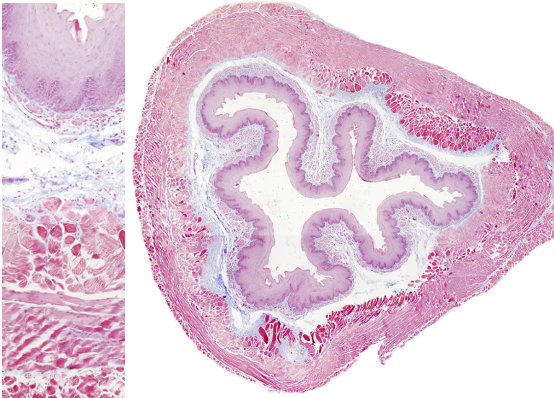 Atlas of plant and animal histology. Technique: paraffin embedding, Mallory trichome. The esophagus a is rather straight tube communicating the pharynx and the stomach. In humans, it is around 25 cm long. It is organized in the four typical layers of the digestive tube: mucosa, submucosa, muscularis propria and adventitia. Mucosa is composed of a stratified squamous epithelium, although in some species feeding hard food, like rodents, it is partially keratinized. Lamina propria is found under the epithelium. 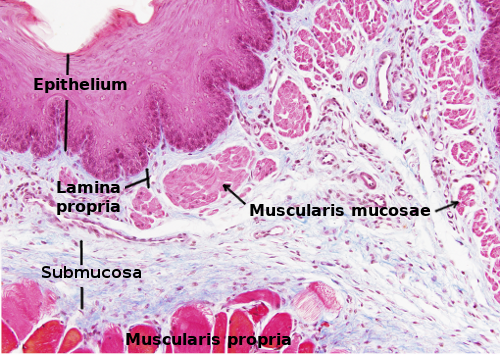 It is a thin layer of connective tissue with scarce cells, scattered lymphocytes and some lymphatic nodules locate close to the excretory ducts of exocrine glands (see below). The muscularis mucosae is, compared with other parts of the digestive tube, quite thick in the upper part of the esophagus, and most of the muscle cells are arranged longitudinally (parallel to the long axis of the esophagus). Submucosa is dense connective tissue with many elastic and collagen fibers, which allow the large expansions of the esophagus wall when the food, alimentary bolus, goes through the lumen downward to the stomach. Submucosa contains many nerves and sensory ganglion cells, altogether forming the Meissner plexus. There are also lymphatic nodules in the submucosa, sometimes extending into the mucosa. Mucosa and submucosa are folded in several longitudinal ridges that shape the luminal surface. These folds are distended by the alimentary bolus in its way toward the stomach. Muscularis propria layer is compose of muscle cells. There are striated muscle cells in the upper one third of the esophagus, continuous with the muscle of pharynx. As we move downward, smooth muscle cells are observed intermingled with the striated muscle cells. The smooth muscle cells proportion increases progressively, and there are no striated muscle cells in regions near the stomach. In this lower part of the esophagus, the organization of muscle cells in two layers is clearly visible, one inner layer with cells arranged circularly and the outer layer with cells oriented longitudinally. Between the two layers, there is a plexus of nerves and glanglionar cells known as Auerbach plexus or myenteric plexus. This nerve network is responsible for the peristaltic movement of the esophagus wall that pushes the alimentary bolus from the oral cavity downward to the stomach. The upper striated muscle cells are innervated by the somatic montoneurons that form the vagus nerve (X), whereas the smooth muscle of the lower part is innervated by the visceral motoneurons of the same nerve. The outer layer of the esophagus is the adventitia, a connective tissue sheet fixing the esophagus to other body structures. Adventitia is substituted by a serous layer when the esophagus enters the abdominal cavity. Scanning electron microscopy image of the esophagus of a rat in transverse section. 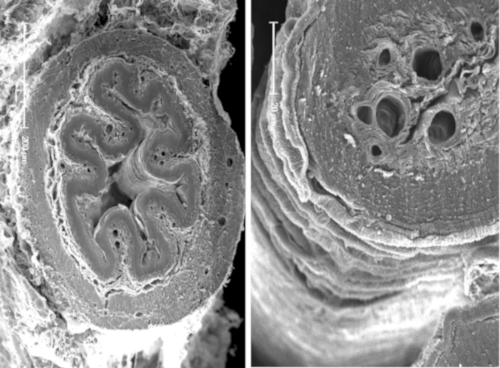 The image on the right shows a longitudinal fold at higher magnification. The esophagus regulates the entrance and exit of the alimentary bolus by means of muscles organized as sphincters. The upper one, known as pharyngo esophageal sphincter, controls the entrance of the alimentary bolus from the pharynx, whereas the lower one, gastroesophageal sphincter, restricts the entrance into the stomach, as well as the stomach reflux. Although a sphincter-like structure is not clearly visible, the regulation of the pass of the alimentary bolus is carried out by the wall of the esophagus at these two transition points. The esophagus contains glands that release mucous substances. In the upper part, the secretion protects against the alimentary bolus abrasion, and in the lower part protects from stomach reflux. Glands are divided in two types: esophageal cardiac and esophageal proper. Esophageal cardiac glands are very similar to the stomach ones (that it is why the name cardiac), their secretory part localizes in the lamina propria of the mucosa, and are more abundant in the lower third of the esophagus, although they can be found in the upper part as well. Esophageal glands proper have their secretory part in the submucosa and are found all along the esophagus, but more frequently in the upper half. They are tubulo-acinar compound glands (see table of gland morphologies).